Stuart Jeffery: Stop digging. Stop drilling. 400ppm breach. Stop digging. Stop drilling. 400ppm breach. While the country gets twitchy about Brexit, immigration and Bake Off, the world is slowly boiling. 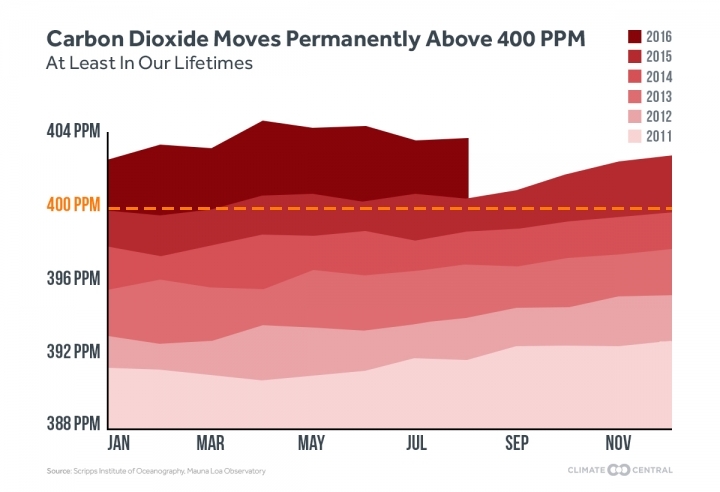 Climate Central have produced this graph showing the 400ppm threshold has been permanently passed. The world can ratify all the Paris agreements it likes but they will become meaningless unless those agreements are matched with urgent action. 2 degrees of warming will easily be breached unless we drastically reduce the CO2 and methane pollution now. It means that we need to start leaving the stuff in the ground. Stop drilling! In February (2016) the world breached 1.5 degrees above pre-industrial levels (1.32 + 0.21 in 1880). That is the threshold that the Paris agreement sought to keep the world to. Breached just two months after the agreement. Monbiot's phrase Stop Digging is one that governments must heed. This cannot wait, there is no time left for procrastination. But how do we convince a world that cares about little else that economic growth, brexit, stopping immigration and what bake off will be like on C4?